DODGE CITY, Kan. – Dodge City Roundup is getting a little more extreme. By teaming with upstart Bullfighters Only, the annual rodeo is bringing back the tradition of freestyle bullfighting in conjunction with its Xtreme Bulls Tour event for the inaugural A Whole Lotta Bull. “For a long time, Roundup was a major stop on Wrangler Bullfights Tour,” said Dr. R.C. Trotter, president of the committee that produces the annual rodeo. “When that tour stopped, I think there were a lot of people who wanted to see it back in Dodge City. 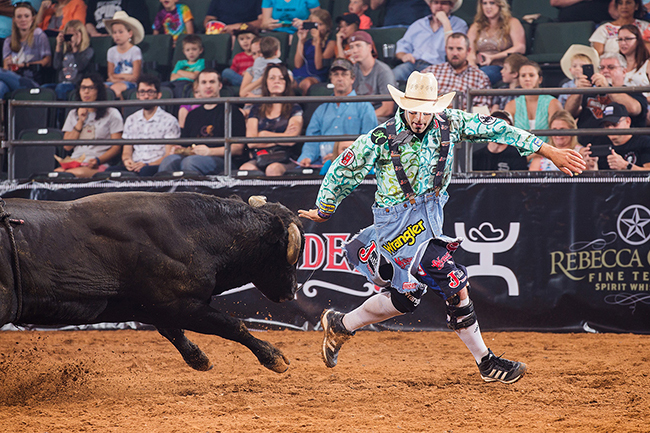 Xtreme Bulls will kick off the festivities at 7:45 p.m. Tuesday, Aug. 2, at Roundup Arena. This marks the third year for event to be part of the annual celebration and features the top bull riders in the Professional Rodeo Cowboys Association. Two seasons ago, Utah cowboy Tim Bingham capitalized on his win in western Kansas to qualify to the Wrangler National Finals Rodeo for the first time. A year ago, Louisianan Jacob O’Mara claimed the title and nearly $5,000; he finished 2015 19th in the world standings, just missing out on the NFR. Bullfighters Only was established about a year ago, and the tour was developed this year. The Dodge City competition will feature five competitors in a showcase of athletic maneuvers waged against aggressive fighting bulls. The three men who serve as cowboy protection for the Xtreme Bulls – Wacey Munsell of Ulysses, Kan.; Nathan Jestes of Douglas, Wyo. ; and Dusty Tuckness of Meeteetse, Wyo. – will make up part of the field. “When Dodge City showed interest in having some freestyle bullfights, they contacted Tuckness and I,” said Jestes, who then guided the rodeo committee to the BFO. Bullfighters Only features the top men in the game. With more than 30 events on the tour, the competition in Dodge City is a vital stop on the BFO’s tour. “I came to Dodge City for the first time last year, and I didn’t know what to expect,” Jestes said. “I knew it was a great and prestigious rodeo, but throughout the six days I was there, it quickly became one of my favorite rodeos all year. The committee treats me very well and puts on a great rodeo. Winning the inaugural Bullfighters Only title in Dodge City would just add more feathers.